Tell us about how/when the business was started and the motivation behind establishing V.I.P. Home Services – Fencing and Home Maintenance. V.I.P. Home Services was pioneered by Bill Vis, and launched in 1979 as one of the first to franchise in the home services industry here in Australia, and is the third oldest franchise of any kind here in Australia. V.I.P. Home Services, provides Lawn & Garden services and Cleaning and is a well respected and long established brand. In August 2015 V.I.P. Home Services partnered with Warren Smith and Vea Johnston who in turn have formed the franchise business opportunity being V.I.P. Home Services – Fencing and Home Maintenance. When and why did you decide to go down the franchise route? Back in 2001 we became Regional Masters and then took up the Divisional National rights for Australia and New Zealand in Fencing. Initially when we started we only had a handful of franchise owners, we then grew the division to 100 operators in a couple of years. In early 2004 we took on the Divisional rights to Building Maintenance, Painting and Pergolas, and by late 2005 when we sold out of three of the divisions we had 43 Regional Masters and over 300 franchise owners combined nationally! July 2014 we took a self-appointed break and sold out of our fencing divisional franchise business. We then set about researching free-standing and other franchise and master franchise businesses and we couldn’t find anything that remotely sparked our interest. We decided to look at doing what we both loved, which was gardening and home maintenance as a stand alone business. It was during the time we were setting up that our friends and family said to us “You’re both really passionate about franchising and helping people to build successful businesses and you have a wealth of knowledge regarding it, why don’t you look into doing it again”? So, we revisited this thought bubble and after investigating various franchise brands the logical conclusion to us was if we are going to do this, it had to be with V.I.P. We joined V.I.P. Home Services as Lawn and Garden franchise operators initially and after seeing how V.I.P. operated and experiencing their culture, we then felt comfortable enough to approach them to consider us setting up a new division servicing Fencing and Home Maintenance customers. It was during this time as a Lawn and Garden operator I was able to personally experience what a franchise owner on the tools goes through daily (Warren already knows full well) and what at the admin/IT level would be required to help their businesses. This for me was a truly unique insight, jumping in the car after an 8-hour mulching day in the heat, covered in dirt and with spiders in my hair! Wow - certainly was a reality check and made me really consider what admin/IT systems our guys would need to help make running their business easier and less time consuming while delivering more professional results. We then had several meetings with V.I.P. in Adelaide and we outlined our vision regarding how things could be done better and to our utter delight they were not only receptive but fully supportive of our ideas and offered us this wonderful opportunity to do something truly different in this sector. What have been the V.I.P.’s F&HM biggest achievements/successes to date so far? It’s only early days, but one of my most satisfying achievements to date is the team we have bought in so far which includes two like-minded regional master couples, these are high energy people, who bring to the table a lot of talent, a willingness to learn, are contributors and team players. At the same time, we are having a lot of fun, which in my personal opinion is a recipe for success. You need to enjoy what you do because it breeds not only a supportive culture but a creative one as well. Speaking of creativity, I am thrilled with the progress of our new and modern systems this has been a massive learning curb for me but I am pretty proud of how it has all come together. Working out the technology platform has been my biggest challenge and to have it fit the business systems appropriately, relevant to the services we offer and what the franchise owners will experience on a day to day basis. This naturally has required a lot of not only time but financial investment into getting it to where we feel it should be and of course ensuring it is tweaked on a regular basis to stay user friendly and current. We are very fortunate that we have the V.I.P. Home Services brand, having been around for quite some time this has really assisted our launch. The national television V.I.P. ad campaigns are also of great value to our division. This does not mean we will rest on our laurels, we use various forms of Social Media, Online Advertising, print media etc and of course one of the biggest forms of marketing is our signage which is out there on the front line every day. A lot of work and time went into designing our image from promotional stationery items, uniforms, websites to vehicle signage and trailers. In a nutshell, we have many tiers of marketing and promotion, National, State, City right down to your local suburbs. We are and will be constantly working and improving these areas and monitoring what works well and what doesn’t. What differentiates V.I.P. 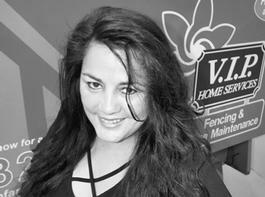 Home Services – Fencing and Home Maintenance from the competition? As I mentioned earlier, we have put a lot of financial investment and time into creating this new franchise business opportunity that is uniquely different from not only our previous franchise business, but other competitors as well. We did not want to recreate something that already existed, what would be the point of that? So our difference is a business that not only embraces new technology business platforms, modern and creative marketing processes, but we also put a huge emphasis on our Paid Training program which in itself is pretty intensive and focuses not only on construction skills, but building a business! In addition, our offer has an interactive support and operations system. We have created a flexible model that is not rigid, and that encourages the franchise owners with the freedom to expand their skills and services, all whilst remaining true to the one brand and for one reasonable initial investment figure. In your opinion, what makes a successful V.I.P. Home Services – Fencing and Home Maintenance franchisee? Essential is communication skills and taking pride in your work! You also need to have ownership of the brand, accountability and responsibility, self-motivation and willingness to follow a system to name a few. What does the future hold for V.I.P. Home Services – Fencing and Home Maintenance? I am excited about our future, our focus is on a smaller niche, quality team Australia wide who are happy in their lives and owning a business they love! We are currently actively seeking like-minded candidates to take up this limited but unique opportunity by becoming Regional Master Franchisees with us. We have franchise opportunities in Fencing or Home Maintenance (or both) available now in Regional Victoria, Melbourne and all of Perth. What advice would you give to someone considering franchising their business? It comes from the very top - quite simply THE RIGHT ATTITUDE! You need to provide leadership, drive and positivity, treat your franchise owners as you would expect them to treat their customers, in other words, don’t be a hypocrite and lead by the right example. This results in the franchise owner giving the customer a positive experience, which in reality is the end goal for any brand that’s wants to stay around for the long haul. It’s important to remember you need to have some fun, so don’t take yourself to seriously! Happy Franchisees = Happy Customers = Happy Franchise Brand! If you had to do it all again, what would you do differently? That is exactly what we are doing, doing it all over again but very much differently and with the autonomy to run the business in a stable, fair and focused manner! Experience really is the difference!